FWIW...…………..have to wait and see how it plays out. While they remain anxious the deal could fall apart, U.S. officials view this as a potential breakthrough that could deter migration and the formation of additional caravans that originate in Central America and cross through Mexico to reach the United States. They have quietly engaged in sensitive talks with senior Mexican officials, attempting to offer a diplomatic counterbalance to President Trump’s threats and ultimatums. Dozens of U.S. asylum officers have been sent to San Diego, where they will begin implementing the new procedures in coming days or weeks, according to Department of Homeland Security officials. Under the new procedures, asylum seekers arriving at the border will be given an initial screening interview to determine whether they face imminent danger by staying in Mexico. U.S. officials describing the new system on the condition of anonymity said they will be able to process at least twice as many asylum claims as they do now because they would not be limited by detention space constraints at U.S. ports of entry. The San Ysidro port of entry in the San Diego area currently accepts about 60 to 100 asylum claims per day. Last month, the number of people taken into U.S. custody along the Mexico border or who attempted to enter without authorization topped 60,000, the highest of Trump's presidency. U.S. officials want to roll out the program at the San Diego border crossing to deal with the caravans that have become a source of frustration for Trump, but they envision it could be expanded to another five to seven crossings along the U.S.-Mexico border. Senior U.S. officials said they want more assurances on how Mexico intends to keep asylum seekers safe and to ensure they don’t get deported back to Central America before the asylum claim gets resolved. After an initial fear screening at the port of entry, the asylum seeker would wait until their scheduled court appearance before an immigration judge. Then they would be escorted to a federal courthouse by U.S. officers, but would potentially have to return to Mexico again if the judge did not reach an immediate determination on their asylum claim. Under the new rules, an applicant whose asylum claim is denied would not be allowed to return to Mexico. Instead, the person would remain in U.S. custody and face immediate deportation to their home country. CNN's Geneva Sands, Kiarinna Parisi, Bethlehem Feleke, Mark Kay Mallonee and Sarah Westwood contributed to this report. Then they shouldn't have allowed them into their nation to begin with. Mexico let them in because they knew they only wanted passage to America. If these people had come with the intention of living illegally in Mexico, they'd have been arrested and deported. Ie: Mexico is facilitating these people and their intentions to illegally enter the US. New Jersey introduced a new directive to curtail local police's ability to inquire about someone's immigration status and turn undocumented immigrants over to immigration officials for deportation. Gov. Phil Murphy's administration has been working on revamping police guidelines regarding immigrants shortly after he was elected last year, according to NJ.com. He said he would make New Jersey a "sanctuary state" during his campaign, but Grewal said the state would still go after criminals. When caught, claiming asylum has become a standard last ditch effort to avoid deportation and is the only reason they claim it. If they hadn't been caught, they would have simply disappeared. Is anyone really dumb enough to believe that they had every intention of illegally entering the country only to directly report to immigration officials so they could claim asylum? What will happen to caravan members who cross illegally into the US? SAN DIEGO - As the sun set Tuesday over Playas de Tijuana, four members of the migrant caravan that has been camped in the city for weeks climbed over a low spot in the new border barrier and were immediately caught by Border Patrol agents. Asylum seekers who cross the border illegally often look for immigration officials to turn themselves in and ask for protection, known to agents as "self-surrenders." Tuesday's climbers chose a point in the recently replaced primary fence where the structure changes direction slightly and a shorter metal plate fills in the gap between taller bollard-style fencing. Migrants hung a white bed sheet on top of the metal plate to use to pull themselves over. It still hung on the barrier as dusk closed in on the area. Noel Miguel Ramos, a 29-year-old man from El Salvador who joined the caravan in Mexico, said he planned to wait for heavy fog to roll in before trying to cross by himself. He's been studying Google Maps to plan his route. "I don't have anything to lose," Ramos said. "Trump said he won't let us in." Even a man with a murder conviction in Honduras spotlighted by the Department of Homeland Security as evidence of "known criminals" in the caravan after he was caught by Border Patrol agents in late November has not been charged. The U.S. Attorney's office referred the Union-Tribune to Customs and Border Protection when asked about the lack of criminal charges. CBP declined to say why some cases are forwarded for criminal prosecution and others aren't, including those who are part of the caravan. The Trump administration began its "zero tolerance" policy shortly before the last migrant caravan arrived in Tijuana, pledging to charge everyone who crossed the border illegally. Though a class-action lawsuit over the separation of families led to fewer parents being prosecuted, zero tolerance has steadily charged adults caught crossing illegally. The policy flooded border courts with cases, and judges in the Southern District of California implemented a program, known informally as "Streamline," used elsewhere along the border to speedily negotiate guilty pleas from border crossers. Federal Defenders of San Diego, which provides legal defense to those who can't afford private attorneys, has been told in recent weeks to prepare to represent a large influx of caravan members, said supervisory attorney Kasha Castillo. On Monday, none of the 20 defendants in the Streamline court were identified as members of the caravan. On Tuesday, four defendants - an unusually low number for the Streamline docket - went before a judge. They also didn't appear to be part of the caravan. On both days, most, if not all, were from Mexico, not Central America. President Donald Trump tried at the beginning of November to bar those who cross illegally into the U.S. from making asylum claims. Shortly thereafter, a federal judge blocked Trump's proclamation from taking effect, saying that Congress clearly set out in law that asylum seekers could make their claims irrespective of their manner of entry into the country. "Whatever the scope of the President's authority, he may not rewrite the immigration laws to impose a condition that Congress has expressly forbidden," wrote U.S. District Judge Jon Tigar. Despite the judge's order, someone crossing illegally could face additional hurdles in his or her asylum application, according to local attorneys. Following former Attorney General Jeff Sessions' changes to immigration case law, asylum officers received a memo in June telling them, among other things, to consider a person's manner of entry as a factor when deciding whether to allow someone to apply for asylum. "USCIS personnel may find an applicant's illegal entry, including any intentional evasion of U.S. authorities, and including any conviction for illegal entry where the alien does not demonstrate good cause for the illegal entry, to weigh against a favorable exercise of discretion," the memo says. It's not clear how much of an effect the memo has had on outcomes from asylum officers' interviews with migrants. Tammy Lin, a San Diego immigration attorney, said soon after the caravan's arrival that she worried some would get frustrated with the months-long wait at the port of entry and decide to cross illegally. "What I tell people typically is this - asylum is already really hard to begin with," Lin explained. "The last thing you want to do is take some action that is putting you behind." Crossing illegally "would complicate things because we'd be violating the law," Edimor said. "It is better to do things the right way." Cristian Mejilla, an 18-year-old from El Salvador, said he's scared to cross illegally, but he's also afraid of applying for asylum because it's not guaranteed. Part of him wants to stay in Mexico, but his goal is to keep going north. He has heard of people crossing by the beach and the airport in Tijuana. Others have gone to Tecate. "I made such a big effort to get here. I'm scared of getting caught and being deported," Mejilla said. "If there is no other way to go to the U.S., I will cross like them." This one is a bit out there. Illegal entry is a federal misdemeanor, and those who plead guilty under Streamline are generally sentenced to time served and then handed back to immigration officials for deportation or asylum processing, depending on the individual case. Or in other words, no punishment at all. Or in other words, give Mejilla what he wants or he'll just take it anyways. What a bunch of f'ing idiots. She said she wouldn't back a DACA deal in order to fund a wall along the United States’ southern border with Mexico. Pelosi spoke to reporters shortly before the House approved a short-term spending bill to avoid a partial government shutdown. Known as a “CR” or “Continuing Resolution,” the measure re-ups all money for the seven remaining spending bills at current levels through Dec. 21. The measure now goes to the Senate for approval. The California lawmaker’s comments come after she released a statement pledging to pass legislation that would put so-called Dreamers — beneficiaries of the DACA plan — on a path to citizenship when Democrats take control of the lower chamber of Congress in January. 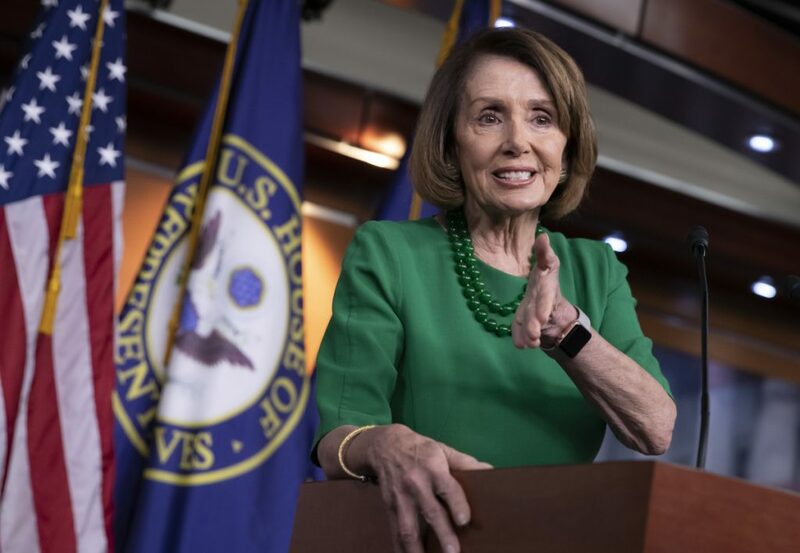 “Our House Democratic Majority will once again pass the Dream Act to end the uncertainty and fear inflicted on patriotic young men and women across the country,” Pelosi said in her statement on Saturday. “Of course, we will meet our responsibility to provide strong, smart border security that serves our country’s needs, is consistent with our values, and doesn’t squander billions of dollars on a border wall." Democratic lawmakers in the House have urged Pelosi to schedule a vote on legislation to protect DACA and immigrants with Temporary Protected Status (TPS) within the first 100 days of the 116th Congress. TPS is a program that allows certain immigrants who have fled armed conflicts or natural disasters — such as those from El Salvador and Haiti – to live and work in the U.S. for a limited time. Ms. Morales has had dealings with Mr. Trump that go back years, and her husband has confirmed that she would on occasion come home jubilant because the club owner had paid her a compliment, or bestowed on her a $50 or sometimes a $100 tip. Ms. Diaz produced similar documents, though since she has gained legal residence she has been issued a genuine Social Security card and green card. That Ms. Morales appeared able to secure employment with what she said were fake documents is not surprising: An estimated eight million unauthorized immigrants are in the labor force, and it is an open secret that many businesses, especially in the service sector, hire them. Mr. Trump has a long history of relying on immigrants at his golf and hotel properties. Though he signed a “Buy American, Hire American” executive order in 2017 tightening the conditions for visas for foreign workers, his companies have hired hundreds of foreigners on guest-worker visas. The federal list posted online of employers who use the E-Verify system includes Mr. Trump’s golf club in North Carolina, a state that requires it, but the Bedminster club in New Jersey, where it is not required under state law, does not appear on the list. During his campaign, Mr. Trump called for expanding the program to workplaces around the country. So far, that has not happened. Mr. Trump opened his trophy club in the affluent horse country of Somerset County, N.J., in 2004. After buying the 504-acre property from a group of investors in 2002, Mr. Trump planted a sweeping colonnade of maple trees at the entrance and built two 18-hole golf courses, their design inspired by the gardens of Versailles. The membership initiation fee is more than $100,000. The job at Bedminster, at which Ms. Morales earns $13 an hour, is one of several she said she has held since arriving in the United States in 1999, crossing undetected into California after a journey of nearly six weeks by bus and on foot. Ms. Morales was keen: The pay would be $10 an hour, higher than the $8.25 that she was earning cleaning guest rooms at a hotel. Ms. Morales said she told her she had no legal working documents. “I told her I don’t have good papers. She told me to bring what I used at the hotel,” Ms. Morales recalled. By the time Ms. Morales was hired, Ms. Diaz had been working at the club since 2010 and had the job of cleaning Mr. Trump’s residence. When Ms. Morales joined the housekeeping team in 2013, Ms. Diaz was in charge of training her, and began to take her to tend to Mr. Trump’s house. In November of that year, when Ms. Diaz quit, Ms. Morales and the housekeeping supervisor took on the job of cleaning Mr. Trump’s house together. Two months after Mr. Trump’s inauguration, in March 2017, Ms. Morales said that she and other workers received a new employee handbook. Ms. Morales said she was given a new employment form to sign. She could not understand the form, she said, but her lawyer, Mr. Romero, said it was likely an updated I-9 employment eligibility document — a form that, like the previous one, referenced her falsified documents. Ms. Morales provided a detailed account of what transpired, but it was not possible to independently confirm what happened. According to her recollection, she told the manager that she did not know how to obtain new forgeries. “I don’t know where to get them,’ ” she said she told him. Ms. Morales expects she will have to leave her job as soon as her name and work status are made public. She understands she could be deported. On Thursday, she spent the day with her lawyer, and as news of her disclosures spread, she did not answer a phone call from her supervisor at the golf course. She said she did not expect to return to work. Maggie Haberman and Ben Protess contributed reporting from New York. Kitty Bennett contributed research. In other words she's a liar, but blames those she deceived for having believed her. Seems like she's saying we should suspect any non-English speaking people who look like immigrants, as being illegal. Is that what she is saying here? If so, even the illegals agree that we need an "English only" law to weed them out. So it goes, nothing was unexpected, One of two main promises, does the Donal shut down .gov? The San Francisco-based 9th Circuit Court of Appeals on Friday denied the Trump administration's effort to delay a judge's order blocking enforcement of its asylum policy. "We agree with the district court that the Rule is likely inconsistent with existing United States law. Accordingly, we DENY the Government's motion for a stay," reads the ruling from a three-judge panel of the court. In early November, the Trump administration clamped down on asylum claims as part of its broader efforts to crack down on illegal immigration. Judge Jon Tigar of the U.S. District Court for the Northern District of California then sided with opponents of President Trump's policy, granting their request for a temporary restraining order against the policy denying asylum to migrants who enter the U.S. illegally. "Whatever the scope of the President's authority, he may not rewrite the immigration laws to impose a condition that Congress has expressly forbidden," Tigar, an appointee of former President Obama, wrote in his decision last month. Trump blasted the decision while dismissing Tigar as "an Obama judge" - a remark that drew a rare public rebuke from Supreme Court Chief Justice John Roberts. "We do not have Obama judges or Trump judges, Bush judges or Clinton judges," Roberts responded in a statement before Thanksgiving. "What we have is an extraordinary group of dedicated judges doing their level best to do equal right to those appearing before them." Trump continued to blast the decision last month while ripping into the 9th Circuit, which has issued a number of rulings against the administration and was set to rule on the federal judge's decision. Trump called the appeals court "a complete & total disaster." The Trump administration appealed Tigar's decision in late November, saying that court's delay, which lasts for 30 days, undermined the president's determination that an immediate temporary suspension of entry between ports of entry was necessary to address the ongoing and increasing crisis facing our immigration system. Friday's decision denies that appeal, meaning that the ban on illegal immigrants seeking asylum remains unapplied. and this is why I love Trump. Pence looks like how I looked as a kid when my parents started screaming at each other in front of me. Fake news those are actors. Give a shite meter on all of what I believed in and wanted to believe in getting closer to pegged. Now resorting to blackmail? That'll really make people want to let them in. Start a business? In Honduras? Wait a minute. Back the f' up. The whole reason they were said to be fleeing Honduras was because it was said to be too violent to live there. If it's too violent to live there, it'd be too violent to take tens of thousands of dollars back with them and open a business. This "demand" of theirs just proves what lying POS's they really are. All they want is what you the reader has, but without having to work for it like you had to. That's because the "shutdown" never actually affects the parts of gov that needs to be shutdown. They're so stupid. What he means by that is the economic benefit of a better trade deal will help the economy more than the tax cost of building a wall hurts the economy. Not that the savings that companies realize due to that better trade deal will be confiscated in order to pay for the wall. The gov still needs to budget for it.